Add some culinary diversity to your takeout routine with food from Brazil, Jamaica, Hungary, Ethiopia and more. The spicy pho satay from Pho Dau Bo. Photograph by Jared Sych. Calgary is home to people from more than 240 different ethnic origins, which means we are also home to a lot of delicious food from around the world. Tagine from Morocco, roti from Jamaica and adobo chicken from the Philippines are all just a phone call away. These 16 restaurants are just a sample of our favourite places to get international takeout. This food is best served communally. Order a few things so that everyone can dig into the same dish of saucy meats and veggies. You can forgo utensils and scoop your food up with injera (the Ethiopian flatbread that serves as your spoon). Vegan dishes are common in Ethiopia so takeout from Abyssinia works whether you are a meat eater or a vegetarian. Recommended dish: The Mahiberawi is a combination platter with seven dishes to try including kitfo (ground meat with butter and spices), k’ik’il (lamb stew), doro wot’ (chicken stew) and kale gommen (kale stew). It feeds four people. If you are dining solo and have to choose just one dish, go for the doro wot’ (it’s the national dish of Ethiopia). Africa is a big continent and this restaurant specializes in the food of Tanzania, Kenya and Uganda with a dash of East Indian fusion. The food here is spicy and, as you would expect from a barbecue restaurant, there are a lot of meat options. Get crispy chicken, Cornish game hen, beef ribs, skewers of beef fat and lamb.You can order to pick up at the Highland Park location or order delivery through Skip the Dishes. Recommended dish: Go all-in with Chuma’s Platter. At $62 it feeds three or four people and comes with a little bit of everything, including beef ribs, chicken skewers, beef and prawn mishkaki (kebabs), lamb chops and mogo (chips). There is a long tradition of fish and chips in England, and Gary and Simone Hodgkinson brought a little of that tradition to Calgary. The couple is from Manchester and Gary can trace the family fish and chip business back to 1915. He’s also studied with the UK Fish Fryers Federation. The couple has two fish and chips restaurants with one in Okotoks and the other in Bridlewood. Get wild cod or haddock with chips, all fried in non GMO vegetable oil. Steak and chicken pies and battered sausage are also on the menu. Get curry sauce to go with your fries and mushy peas as an additional side to be extra British with your food choices. Wash it all down with Irn-Bru, the number one selling soda in Scotland. Recommended dish: The classic six-ounce fish and chips with curry sauce on the side. You can get groceries at Caribbean Choice if you want to try making West Indian food yourself. Or you could leave it to the pros and just buy ready-made takeout. Caribbean Choice makes Jamaican patties, brown stew, jerk chicken and curries as well as roti. On the weekends there is also a Saturday and Sunday special. Recommended dish: Caribbean Choice might have the best roti in the city. You can choose veggie, beef or chicken. Part of the appeal of going to Gaucho Brazilian Barbecue is the rodizio style with wandering barbecue chefs that come to you and carve meat onto your plate until you tell them to stop. If you can’t do that, the takeout is just as yummy. Create your own meal by choosing from barbecue options like rump steak, top sirloin, parmesan beef, pork loin, chicken wings or sausage and adding on three sides from rice, black bean stew, mixed salad, toasted mandioc flour, ceasar salad cabbage salad, tomato and palmito salad and potato salad. If you need takeout for a larger group, there are platters that feed five, 10, 20 or 40 people. Recommended dish: The parmesan beef barbecue. The best Chinese takeout is usually the one closest to you, but Great Taste is worth the effort to get takeout or have it delivered to you through Door Dash. It serves Shanghai, Sichuan and Cantonese dishes and is closer to authentic than most Chinese restaurants in Calgary. There are two locations in Calgary, with one in Chinatown and the second in Huntington Hills. Recommended dish: The xiaolongbao (aka steamed pork dumplings) is a soup dumpling filled with juicy pork and hot broth. With thousands of islands and hundreds of ethnic groups, Indonesia is a diverse culture with a lot of influences on its cuisine. Ibu Sari, the woman behind Indonesian Kitchen, is from Bandung and specializes in Indonesia’s Sundanese and Javanese cooking. It’s easy to find gluten-free and vegetarian options on the menu and all of the spice mixes are prepared fresh with root stock. Order several dishes to share or order from the Meals for One section of the menu if you don’t want to share. Recommended dish: Rendang or coconut beef takes more than a day to prepare with the spices slowly soaking into the beef. It’s one of the five national dishes of Indonesia. It’s usually served to honoured guests, but you can order it anytime from Indonesian Kitchen. This family-run Hungarian restaurant has been open for nearly 20 years and is almost always full of regulars. Its dishes are hearty with a menu that includes wiener schnitzel, cabbage rolls, stews and paprikash. There are daily specials that include roasted duck on Wednesdays and Hungarian style chicken liver on Tuesdays. Recommended dish: The chicken paprikash with homemade sptzle is deliciously comforting. It takes a long time to prepare Moroccan food and the experience is usually a relaxed one that takes all evening as you sit on cushions while your food slowly cooks. If you would prefer to lounge at home, Moroccan Tent offers takeout and delivery. This is a good takeout option for a cozy date night or for when you want to stay in but you still want a meal that feels a little special. Recommended dish: The b’stilla is a perfect example of the blend of sweet and savoury in Moroccan cuisine. Chicken, eggs, onions, ginger, saffron and almonds are wrapped in pastry and dusted with sugar and cinnamon. The NT Burrito. Photograph by Jared Sych. This Mexican restaurant uses a grill that burns both charcoal and wood to give its meat and veggies a smoky, charred taste. The menu here is Mexican street food and the vibe, while still casual, is slightly more upscale than your average Mexican taqueria. Native Tongues has a takeout window and now delivers. Recommended dish:The NT Burrito. It’s only available for takeout and it is stuffed with beans, rice, guacamole, salsa fresca, carnitas and lettuce. In Calgary, we are spoiled for choice when it comes to restaurants serving hot pho, vermicelli bowls and subs from Vietnam. A longtime favourite is Pho Dau Bo in Forest Lawn. It’s been around for 10 years serving spicy sate and crispy spring rolls. Now that it has partnered with Uber Eats and Door Dash, you can get this ultimate comfort food delivered right to you, which will be especially comforting when winter comes. Recommended dish: The pho sate is the most ordered dish for good reason. The broth takes 16 hours to make and it’s spicy enough to give you the sniffles. As you might expect from its name, chicken has its own section on Pio’s menu. What makes its chicken unique and Peruvian are the housemade sauces that come with it. The white, green, yellow and red sauces are made with herbs and peppers imported from Peru. Beyond chicken, Pio has dishes including ceviche, fried green plantains, curry, beans and rice and trout. Recommended dish: The pio con plantano frito is chicken with fried sweet plantains and feta cheese. You get two dipping sauces and can add sausage if you want. Filipino food is a blend of Malaysian, Indonesian, Indian, Chinese, Spanish and American cuisines. All of those flavours become distinctly Filipino in the sauces, marinades and gravies. At Roc’s you can get bowls of rice topped with stewed meat, egg noodle soup with shredded chicken and seafood balls and crispy pork belly in a tangy, garlic gravy. Dine-in and takeout options include all day breakfast, barbecue meals, rice and noodle bowls and platters for two. If you have a bigger crowd, you can scale up from fiesta platters (for four to five) and party platters (for 10 to 25) all the way up to getting a whole roasted suckling pig delivered to you. Recommended dish: The Adobo platter. Your choice of chicken or pork is simmered in garlic, soy sauce, vinegar and peppercorns. It’s yummy and it serves two people. This takeout place mostly sticks to what it does best by filling pockets of dough with potatoes, spices and meats to create Punjabi-style samosas. It supplies restaurants across western Canada and has two locations in Calgary where you can pick up your own order. Buy large, medium or mini samosas with fillings including vegetable, beef, chicken and spinach and cheese. You can get full orders, half orders, party platters and lunchboxes to feed any amount of people you need. Add made-to-order, gluten-free pakoras to your order. The Samosa Factory can get busy so call ahead to have your order waiting for you. Recommended dish: The lunch box comes with four medium-sized samosas, chole (chickpea curry) and chutney for $7 ($6 if you choose the vegetable samosas. If you are looking for some Asian street snacks that can be picked up or delivered right to you, Tokyo Street Market is one of the newest options in Calgary. The restaurant comes from the people behind Ke Charcoal Grill and Kinjo Sushi and is in Crescent Heights. If you eat there, add draft sake to your meal. If you’re in the mood to eat at home, the pickup and takeout menu has the same tasty fare, including yakitori, oden, donburi, takoyaki and gyoza, all for $5 an order. Recommended dish: Oden is a one-pot dish that you can build. A $5 order gets you your choice of five mix-ins from daikon, fish cakes, konjac cake, egg, beef tripe, beef tendon and beef brisket. Cashew chicken. Photograph by Jared Sych. Thai Sa-on is one of the best Thai restaurants in Calgary. 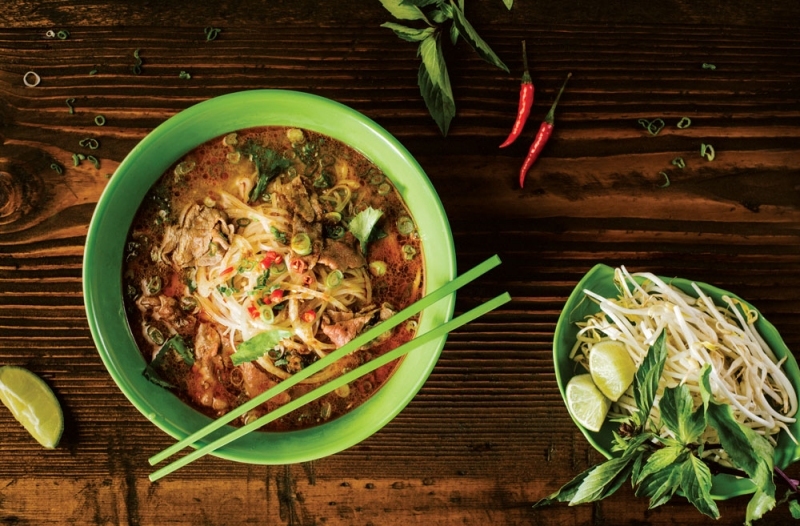 So when its owner, Sam Chanhao, opened his first Tuk Tuk Thai in 2015 with a menu based on the most popular dishes from Thai Sa-on, lovers of fast-casual takeout meals rejoiced. Now Tuk Tuk Thai has five locations in Calgary and its own app that makes ordering easy. The food is fresh and flavourful and comes in those great lotus flower-shaped takeout containers that fold out into a plate. Recommended dish: Crying Tiger comes with beef or pork, cilantro, green onion, romaine lettuce, carrot, chili lime dressing and crispy rice crumbs, all served over rice.